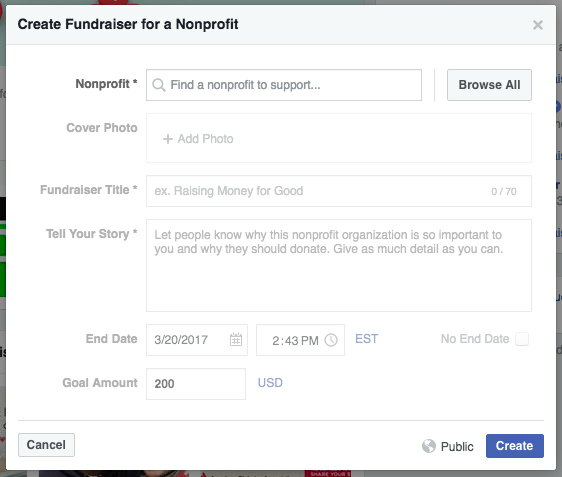 Facebook has listened to the needs of nonprofits, associations, and churches and added some very nice functionality to help support your online fundraising through your org’s Facebook Page. In this post, we’ll lay out step-by-step instructions for raising money through Facebook. New nonprofits can get access to Facebook's donation and fundraising tools just by asking. What kinds of tools? Well, we’ll talk about many of them here throughout the post. You can add a donate button to your page and even receive funds through Facebook’s Payment Platform. Who can qualify to get access to Facebook’s Fundraising Tools? US-based 501(c)(3) nonprofit organizations registered with the IRS. Has a bank account registered with a licensed financial services institution. Has accepted Facebook's terms of service here. Has a Facebook page that complies with Facebook’s community standards posted at (www.facebook.com/communitystandards). These factors are reviewed on an ongoing basis. If a nonprofit is found to be in poor standing against one or more of these requirements, we may choose to disable the tools. How can I request access to Facebook’s Fundraising Tools? Allow at least 2 weeks for the application to be processed. You can now add a Donate button on your organization’s Facebook Page. Keep in mind your Page's category must be set to "Nonprofit Organization" in order to view the Donate Now call-to-action button. You can add the Donate button to the top of your Page the same way you add other call-to-action options. One big caveat: The feature is not available to everyone, as it is still gradually rolling out, but We’ve found that many pages do have access, so give it a shot. How Do I Add a Donate Button to My Facebook Page? Navigate to your organization’s Page. On the cover photo, you’ll see +Add a Button. Choose your CTA, select Donate. Enter the URL for your online donation page. Individuals can create Fundraisers for a nonprofit of their choice. This means, even if you have limited online fundraising tools, you can still encourage your audience to create fundraisers of their own and harness the power of their individual Facebook network to raise money for your cause. Individuals should find Fundraisers in their left menu under Explore. Or, you can point them here. This feature is only available to individual profiles, and not through your Page. Your nonprofit must have a registered Nonprofit Page on Facebook so that individuals can create a fundraiser for you. Click “Create a Fundraiser” button here or in the left menu of your News Feed. You can create a Public or Private fundraiser. Promote your Fundraiser on your timeline and share with friends! 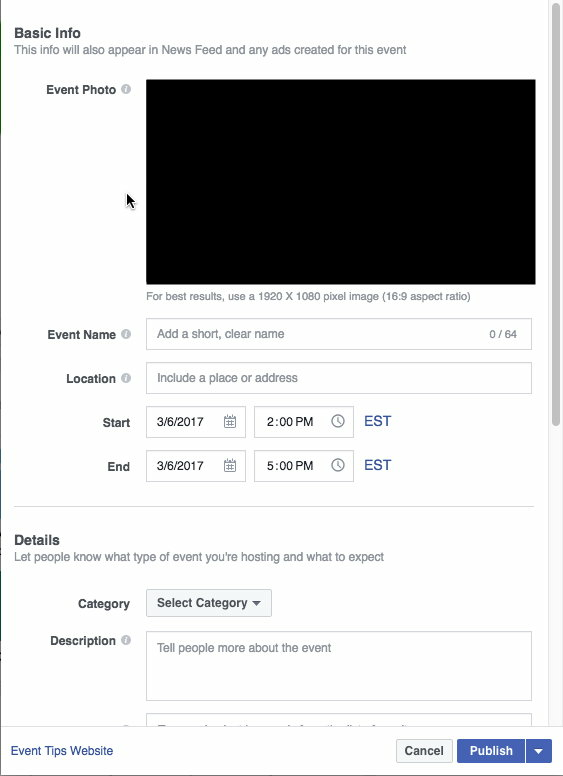 A Facebook Event is a great way to build some buzz around your next big campaign, project or special event. You can use an event to promote an online fundraising campaign, or to get people to register for a free or paid event. The benefits of a Facebook Event are all about word of mouth. When someone marks “Interested” or “Going” to an event, their friends see the event and have an opportunity to mark Interested or Going as well. Then, they’ll get reminders about the event and the event will spread very quickly throughout friend networks. Designate an event manager to regularly update the event with details and respond to posts, comments, and questions. Decide if your event will be public, private, and if guests can invite others. Have a photo ready for the cover photo, along with all pertinent details about the event. From your Page go to the Events section on the left side menu, or click Create an Event at the top of your page. Enter details for your event. You’ll be able to edit them later. Post Links to your fundraising page, photos, updates, and always tag people who will be involved in the event. Once you publish your event, you can invite friends and designate others to be Admins of the event. This year, Giving Tuesday is November 28, 2017. In the past, Facebook has partnered with this movement, and it's definitely worth looking into again this year if you've never participated before. "For #Giving Tuesday, the Bill & Melinda Gates Foundation matched a total of $900K in donations, matching each donation as it came in until we reached $900K in matching funds." Here's how you can get involved with Facebook's partnership with Giving Tuesday.